It also brings forth the realization of the suffering of the US people during the sept. 11 WTC incident. Ofcourse, that doesn't means that I support the killing of Muslims in Iraq and Afghanistan but more accurately, I sympathize with the victims of the WTC incident. I was in my uni's computer lab on the top most floor awaiting the arrival of my C++ teacher when the earthquake struck. The whole floor shook and there was some panic in the students which thankfully abated some before we evacuated the building in quite a civil manner. We descended the floors to the ground level and assembled near the uni buses. One of the buses was literally swaying lengthwise and breadthwise. It was terrifying to witness such an event. After the shockwaves abated, we resumed classes till shockwaves were felt for the second time. We saw visible cracks in the walls and saw rubber seals between the Aluminium brackets and doors popping out. 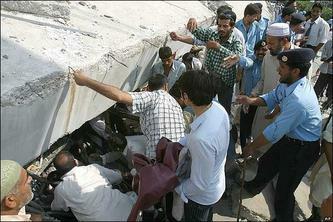 Meanwhile, we heard the rumours that several buildings had collapsed in Lahore, Peshawar, Rawalpindi and Islamabad. The collapse of the two top most floors of the resedential complex; Margalla Towers was the prominent one here in Islamabad. Later we heard that a whole block (out of two) consisting of 7 apartment floors (not sure of the number) of Margalla Towers had collapsed and there were several people reportedly injured and dead. After that the students were shifted to another building. The students and faculty were continuously getting calls on their cell phones regarding their safety and well-being and vice versa. I just got home from uni when I turned on Geo TV and heard all those reports for myself. It was atleast 7.6 on the Richter scale and the Japanese Meteorological(?) Department is said to have measured it as 7.8 on the Richter scale. It is the highest level (on the Richter Scale) of earthquake that I have experienced in my life and it was a sad, terrifying and unique experience. The loss of life is terryifying and devastating for the relatives of those who lost their loved ones. I simply hope that time will be the continuing healer it has been for the longest time for those who lose their loved ones. That's what has happened yesterday and today. The education minister has announced a holiday in all educational institutions but NIIT, considering itself above other educational institutions, hasn't given a holiday. Bloody berks! This entry is an old one from my Yahoo! 360 blog.